A novel magnetic attapulgite–biochar composite (MABC) derived from natural attapulgite, cauliflower leaves, and FeCl3 was successfully prepared as a low-cost adsorbent for oxytetracycline (OTC) removal from aqueous solution. Characterization experiments by different techniques suggested that attapulgite clay particles and Fe3O4 nanoparticles were successfully covered on the MABC surface. Compared with the pristine biochar (CLB) and attapulgite–biochar composite (ABC), MABC had the largest surface area, well-developed pore structure, and more surface oxygen-containing functional groups which could interact with organic pollutant via hydrogen bonding, π–π electron coupling, complexation, and ion exchange. The maximum adsorption capacity of MABC by the Langmuir model was 33.31 mg/g, which was dramatically higher than that of CLB and ABC. The effects of solution initial pH had little difference on the adsorption of OTC because of the buffering effect. 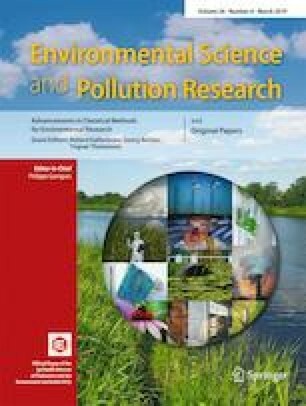 Adsorbent-regeneration studies of MABC exhibited good reusability and separation property. All the results indicated that MABC could be used as a potential adsorbent because of its easy preparation and separation, high efficiency, wide pH range application, and abundant and cheap raw materials in the global ecosystem. This work was supported by Gansu Natural Science Fund, China (17JR5RA218), and the Fundamental Research Funds for the Central Universities at Lanzhou University (lzujbky-2017-212).